When you're preparing to move across the Atlantic Ocean in less than a month and working on cramming all of your life's possessions into one suitcase every day between your baby's diaper explosions and sporadic naps, sometimes the only thing standing between you and complete insanity is a big, cheesy pan of creamy pasta. And when I say you, I actually mean me. We are sure going to miss Berlin. It really has become home, and always sort of will be since it was our first home together. It's going to be a huge contrast moving from Berlin, Germany to a small town in Michigan, but I think it's going to be a good change. As much as we love the excitement of the big city, I think (and hope!) that we are still small town Americans at heart. 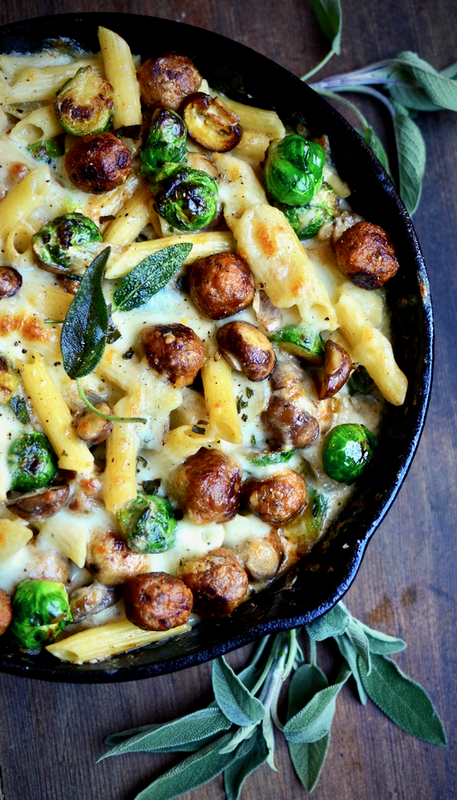 With all of this hectic stuff going on, only the quickest and easiest dinners will do. I know this pasta looks really gourmet and complicated and stuff (or maybe I'm just flattering myself?? ), but in reality it's really easy to make. All I wanted was to warm up a frozen bag of Sam's Club meatballs for dinner. Until, one day, I decided to make the easiest meatballs ever. I just used some rice flour instead of breadcrumbs. Worked great. Then I decided to make a small batch so that they wouldn't all get broken when I try to cram too many huge meatballs into a pan. Plus I mixed the meat together in the pot that I cooked the noodles in so I wouldn't have an extra bowl to clean. Pretty genius, if I do say so myself. 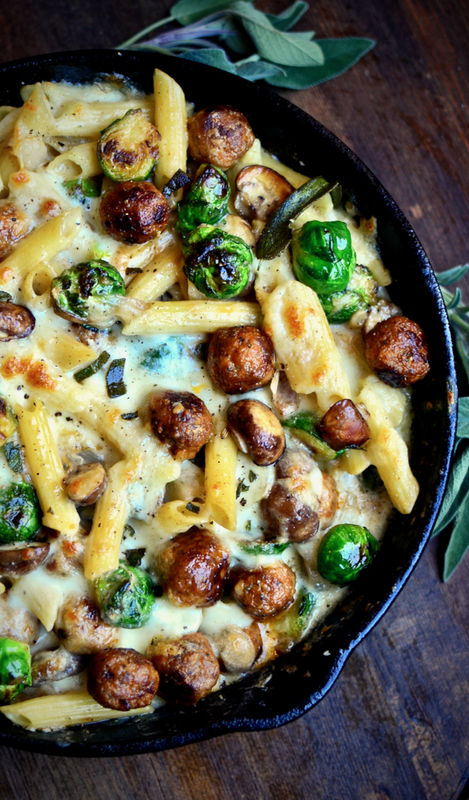 After I had the meatballs down, I added some crispy brussels sprouts, buttery onions and mushrooms, and some fried up sage, threw in some creamy white wine sauce and broiled some fresh mozzarella on top. As soon as I tasted my creation, I immediately wrote down the recipe and sent it to my sister before I could forget what in the word I did to create my new favorite pasta. First mix together all of the meatball ingredients. I mix them up in the pot that I cook the pasta in to save a bowl to clean. Put a few tablespoons of olive oil in your skillet on medium heat. Roll the meatballs into rounded teaspoonfulls (or whatever size you like) and place them in the pan. Cook the meatballs, gently stirring to brown all sides. Cook until browned and cooked through. Set aside in a large bowl. Start the noodles cooking and cook according to package directions. Put the brussels cut side down in the pan (if there isn't enough oil from the meatballs, you can add a little more olive oil). Cook on medium heat until the cut side is brown and crispy. Stir and continue cooking until "al dente". 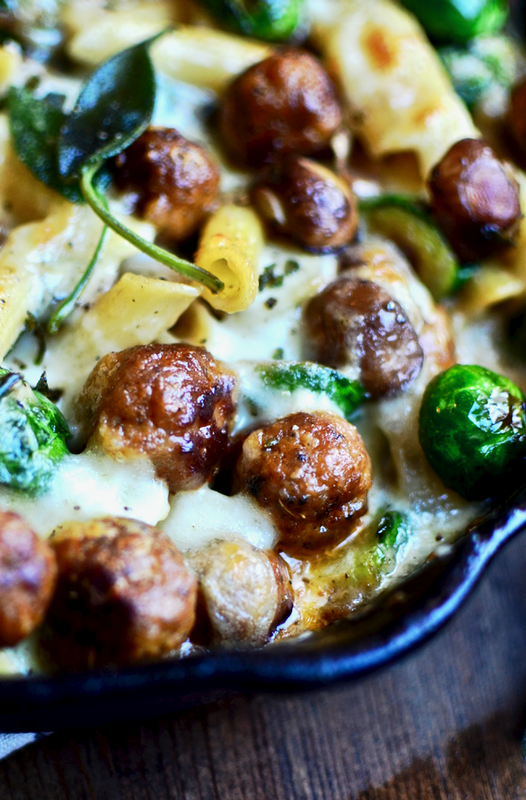 Remove from the pan and add to the bowl with the meatballs. Add the butter to the pan. Throw in the onions, garlic, mushrooms, and sage. Cook until everything is browned. Add the flour to the pan and stir to evenly distribute. Add the wine and stir well. Then add the half and half and stir until no lumps remain and the mixture is thickened. Add the salt and pepper. 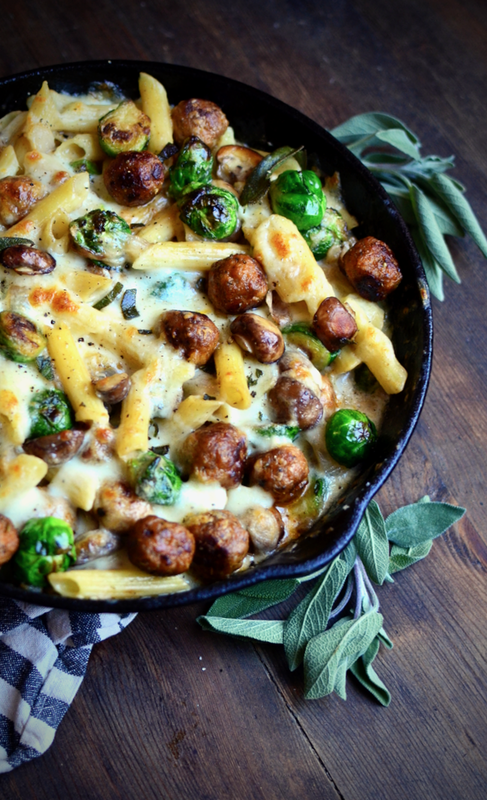 Add the cooked and drained pasta, brussels sprouts, and meatballs to the pan and gently fold everything together until it's all evenly distributed. Top with mozzarella. Broil in the oven until the cheese is melted and browning.